It looks like a big deal, but it’s really very simple. Whatever you’re looking at has to be seen as if it were trapped in a cube. One point perspective applies when one side of the cube you’re drawing is parallel to the bottom edge of your drawing paper. The first step is to determine the horizon line. It’s your eye level. 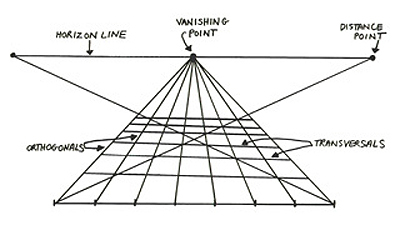 Pick a point on that line and that’s your vanishing point. During the Renaissance, perspective functioned as an extension of church dogma. It became a visual representation of unchanging order in a society where the lines of authority were clearly defined, someone at the top had all the answers and the earth was said to stand still with the sun circling around it. As Marshall McLuhan put it, “A piazza for everything and everything in its piazza.” In 1905 Einstein said, space is curved, parallel lines intersect and time and space are relative. Artists in the 20th century expressed their discomfort with any kind of dogmatic piazza by, among other things, throwing out perspective. 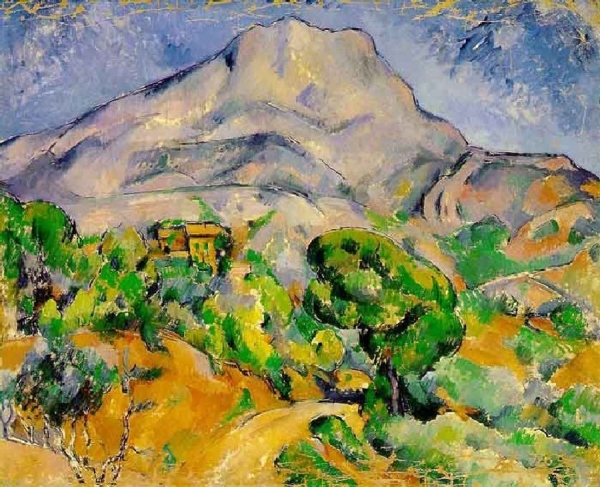 Already in the 19th century Cézanne had painted his mountain without regard to perspective. He just pushed it up in the picture plane, made it big, when according to the laws of perspective it would have had to be a tiny triangle in the distance. Picasso went even further. He drew table tops in any odd shape he wanted and often his perspective lines converged not in the distance but in front of the painting, on the forehead of the viewer. This was an explicit rejection of the Renaissance and the social and religious order it stood for. 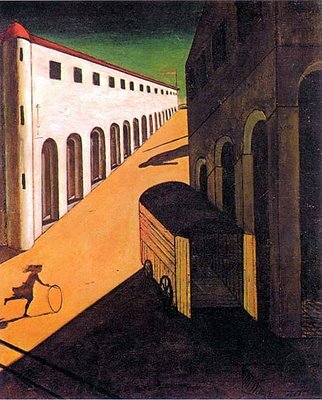 De Chirico, in the 1930’s, constructed urban spaces with multiple vanishing points, as if to say, there’s no one way to perceive the world, folks; consciousness is a messy thing. These artists were widely regarded as insane. C.G. 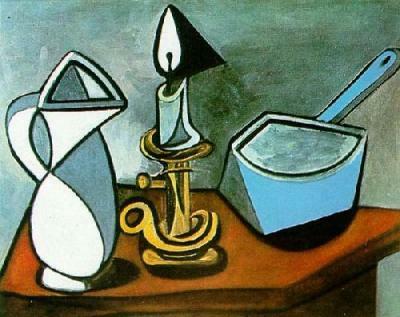 Jung, for example, judged Picasso’s art to be the work of a deranged mind. Ah, it’s easy to long for the gleaming marble tiles of that orderly piazza in a world that stood still. 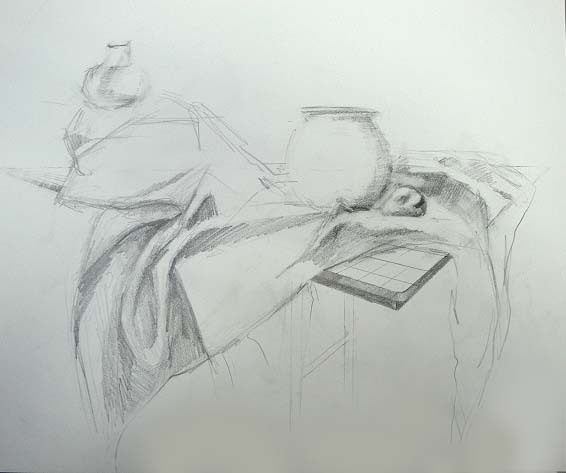 Last week, in my drawing class, we covered the mechanics of one-point perspective and students immediately were able to use this new tool in their still life drawings. No one pretended that we were back in some piazza of the geocentric Renaissance. But working with this tool—perspective—proved to be delightful, because it literally draws the viewer into the space and because the precision of the perspective lines functions as a counterpoint to the chaotic shapes of the drapery. Drawing by Sarah R.
Two-point perspective adds another dynamic: the triangle standing on a vertex. 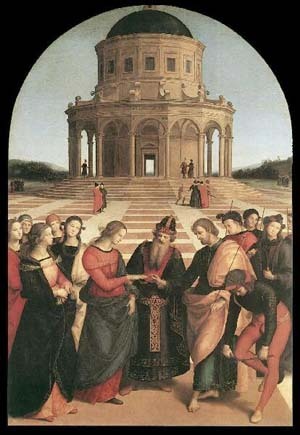 This angle creates a feeling of instability, uncertainty, questioning, something Raphael would never have dreamed of. 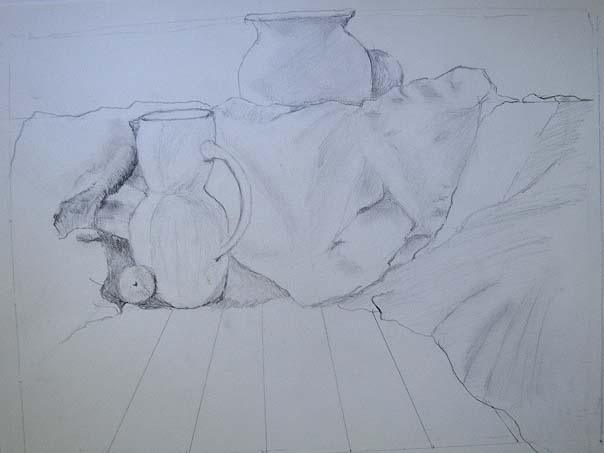 One student, Cheryl B., remembered the two-point perspective tool from a previous class, some months ago. The protruding table corner becomes part of a composition that plays on the repeating motif of the triangle. 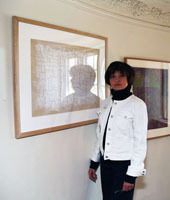 The drapery at left forms one of several triangles in this drawing and the composition as a whole defines a triangle. Because the table legs are not developed further but are left as pale lines, the whole mass appears to be suspended in space–a long way from the certainties of the Renaissance.